Who is Alexandria Ocasio-Cortez, who defeated powerful Democrat Joe Crowley in New York? 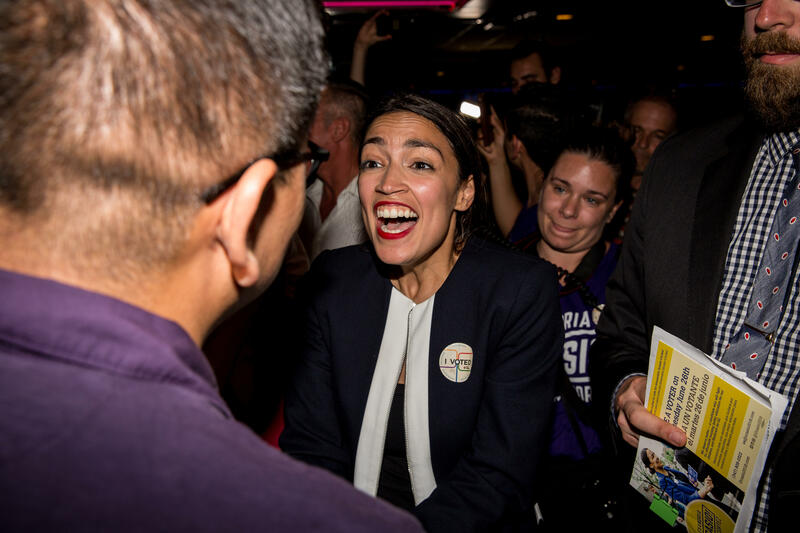 Alexandria Ocasio-Cortez, defeated powerful Democratic Rep. Joe Crowley Tuesday night. In one of the most shocking upsets so far of the 2018 primaries, the 28-year old millennial won as a first-time candidate in New York's 14th congressional district. Crowley, who has held the seat since 1999, had risen to become the fourth-highest leadership position in the House, and was considered a potential House speaker if the Democrats took the House. "We meet a machine with a movement, and that is what we have done today," Ocasio-Cortez said in her victory speech. "Working-class Americans want a clear champion and there is nothing radical about moral clarity in 2018." Ocasio-Cortez, a first-time candidate, was so unknown, she wasn't profiled by The New York Times before the race, CBS News political correspondent Ed O'Keefe noted Tuesday. But her campaign video went viral, racking up 300,000 views on its first day. In an interview with CBSN's Tanya Rivero in May, Ocasio-Cortez said she wrote it herself. A native of the Bronx who attended Boston University, Ocasio-Cortez is a member of the Democratic Socialists of America, a community organizer who worked for Sen. Bernie Sanders' 2016 presidential campaign. Crowley outspent Ocasio-Cortez 18-1, and she told CBSN in May that the average contribution to her campaign was $17 a person. "We have blown through well past $200,000 for this race, all in small-dollar working-class kind of contributions," Ocasio-Cortez told CBSN in May. "There's no way you can write policy without thinking of your donors, if you're taking an insane amount of money (from) special interest lobbies. So by not taking money from lobbyists, by taking money from working-class people, we can legislate for working-class people." New York's 14th Congressional district covers parts of Queens and the Bronx, and is 50 percent Latino and 70 percent voters of color, according to New York magazine. As part of her platform, Ocasio-Cortez told CBSN she wanted to defund Immigration and Customs Enforcement (ICE). She recently traveled to the border at Tornillo, Texas, to protest the Trump administration's family separation policy. "ICE was just established in 2003 and it was established outside of the U.S. Department of Justice, so a lot of this disturbing behavior we are seeing – parents can separated from their children, people getting picked up on the street – it's happening outside of the Justice Department," Ocasio-Cortez told CBSN. "Before ICE was created, we had a system – it was the INS – so it just goes to show there is another way we can handle immigration – there's another way we have handled immigration, there's another way we can handle immigration. But the basic structure of ICE is extrajudicial and what we really need to do is re-assess our approach to immigration in the United States." Ocasio-Cortez is also a supporter of a federal jobs guarantee, a $15 minimum wage throughout the country, expanded Medicare for all and a "Green New Deal" to combat climate change. She also highlighted to CBSN the importance of funding education and health care. "Right now, education and health care have kind of been third, fourth, fifth, sixth on the list in terms of our funding – and what we really need to do is assess and also make sure corporations are paying their fair share as well," Ocasio-Cortez said. "After the GOP tax cut, that alone could have paid for tuition-free public college for two years." President Trump weighed in on Tuesday's election result on Twitter, calling Crowley a "big Trump hater" in one tweet and then writing that the Democrats are in "turmoil."